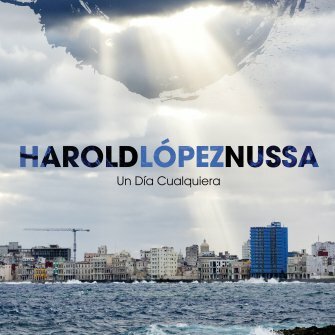 Pianist Harold López-Nussa continues to hone his unique version of folk-jazz, intimately drawn from the conservatories and barrios of his native Cuba, where he still resides. Un Día Cualquiera translates into “Just Another Day,” and depicting the typical joys, struggles, and beliefs informing all of our lives is his intention here, with the understanding that Cuban life is what he knows best. He opens with a fanfare, the whirlwind “Cimarrón,” an original composition he first recorded back on A New Day in 2013. But then he steers toward the soul of Cuba with “Danza de los Nañigos,” the first of two covers by Ernesto Lecuona, known as the “Gershwin of Cuba” for the amiable sophistication and indigenous influences of his jazz/pop/classical hybrids. That’s followed by a lovely tribute to the pianist Bebo Valdés (Chucho’s father), “Una Tarde Cualquiera en Paris,” which captures the lively elegance and flow of Bebo’s approach to the ivories. This is where we first notice the woodier tone of Cuban Gaston Joya, who replaces the Senegalese bassist Alune Wade in López-Nussa’s trio, beside his brother, Ruy Adrian López-Nussa, on drums. The rest of Un Día Cualquiera is a cohesive hopscotch through the touchstones and colors of Cuban culture. The harsh rhythms of “Elegua” mimic the bata drums and Yoruba chants López-Nussa heard in religious ceremonies growing up. “Hialeah,” named after the heavily Cuban Florida city outside of Miami, is sleek and fun-loving, a great companion to the circus-like bounce of Lecuona’s “Y la Negra Bailaba” and Rafael Hernandez’s classic dance-party rumba from the 1960s, “El Cumbanchero.” A gorgeous, emotionally resonant take on the 1946 bolero “Contigo en la Distancia” pays tribute to López-Nussa’s former employer, the great singer Omara Portuondo, who taught him the value of interpreting a song. The closer, “Mi Son Cerra’o,” is loose-limbed group improvisation patterned after the descarga jam sessions on son montunos and boleros in the ’50s. The atmosphere makes it feel like you’re with folks you want to get to know better. Preview, buy or download Un Día Cualquiera on Amazon!